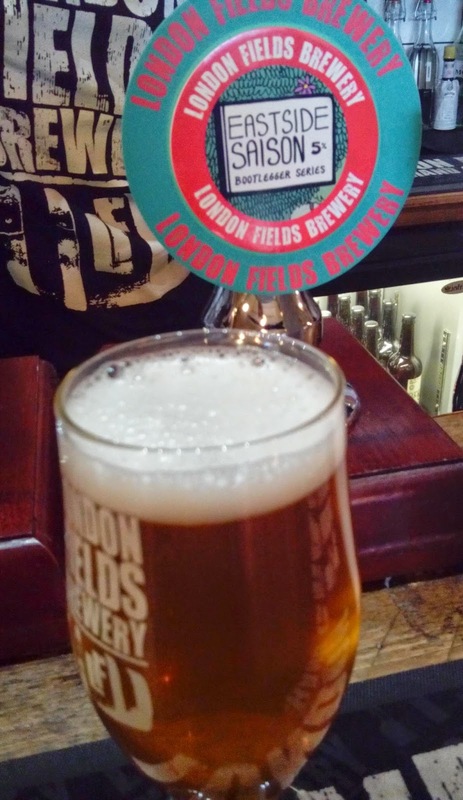 The latest in London Fields Brewery's occasional Bootlegger series is a 5.5% Saison, and what a nice example of the style it is. It's also cask-conditioned and on handpump, which makes it all the more refreshing and genuine - I mentioned this to LFB head brewer Fabio Israel (I'll post a longer interview with him here as soon as I get the time) and he agreed that it's more "farmhouse" than the fizzy versions you'll find in the craft bars. Just to prove the point, the taproom also had the Saison on keg, but that version was lacklustre and ordinary, all fizz and no knickers you might say (but probably wouldn't!). So anyway, the cask version is a deep gold and the first impression is almost a Dortmunder Export, malty and faintly sweet, before that funky farmhouse Saison note sweeps in, accompanied by a dry and lightly peppery bitterness. There's also ginger and grains of paradise (another gingery spice) in there, contributing a spiciness most evident in the aftertaste. Saison is still fashionable in the UK, although some might argue it has already jumped the shark in the US, to be supplanted by the likes of Farmhouse IPA (essentially an even hoppier Saison). Meanwhile in places such as Germany it is only just taking off. I had my first two German Saisons (and one of those was actually brewed in Belgium) earlier this year. A spiced cask version makes it a bit more interesting and is to be applauded - look out for it!